This is a unique way of grilling baby back ribs, or any pork rib for that matter. There is a restaurant in Memphis, TN called Rendezvous Ribs. It is world renowned for their ribs, even though they don't do them the traditional way, they do them over charcoal with their own seasoning. Elvis loved them. When he was in Vegas doing his shows he would have them flown out first class. But, this works in your favor. The recipe for the rub and the method of cooking the ribs described in the video will result in ribs that taste truly authentic to the Rendezvous tradition. 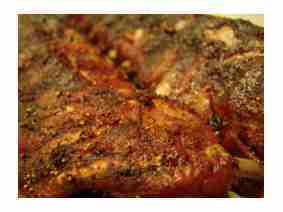 The recipe makes enough rub for 4 to 5 pounds of ribs. 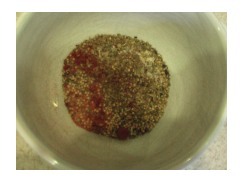 There is also a "mop" that goes with the recipe that is comprised of white vinegar, water and a couple teaspoons of the rub. This is "mopped" onto the rib while they are cooking. In terms of heat, indirect charcoal heat is what is used, and I would HIGHLY suggest finding a rib rack like the one I am using. They are inexpensive and give you so much more room to grill more ribs on a small area. One last suggestion. Watch the video! Leave Grilling Baby Back Ribs and Return to BBQMyWay Homepage.